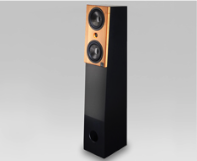 A fully integrated solution... the KS Digital ADM25 Active DSP Nearfield Studio Speakers. The ADM25 is KS Digital's innovative speaker / stand combination that gives you incredible performance matched with our excellent Firtec DSP. It is an active monitor built into its own stand, which gives the listener perfect time alignment and phase response. So many KS creations are built into this exceptional speaker--phase linear playback via the D'Apollito emitter, perfect time alignment, extreme neutrality in frequency response and phase response, 35 Hz to 24 kHz performance, Firtec DSP for correcting the speaker output to perfectly match the input signal, and more. And despite these numerous concepts built into the ADM25, it is our lowest-priced entry into our Firtec DSP studio monitoring line! The KS Digital ADM25 is the perfect monitor for behind your console. Simply plug and play these powerful integrated studio speakers--position them behind your console, plug in your output, and you have the perfect combination of speaker and stand built into one. Because the stand is designed as a fully integral part of the speaker performance, this system is incredibly accurate at all frequencies, perfect in its phase response, and absolutely stunning to hear. It reveals details that no other speaker can... it's another KS "have to hear it to believe it" original. An ultra-wide sweet spot and precision Firtec DSP round out this complete package, giving you the most sonically accurate playback of your source material available. And, it's magnetically shielded for safe usage next to your computer monitor. 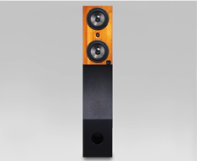 Perfect as nearfields, with abundant power to be your main studio speakers. The fast-acting MOSFET power amps are mounted on the back of the speaker, as well as an XLR input, volume control, bass level control, high frequency level control, low cut frequency control, IEC power, and on/off switch. All this is built into the integrated speaker stand, providing the ultimate all-in-one design with the most accurate reproduction of sound you've experienced. With dual 170W LF amps / 80W HF amp, this powerhouse can handle nearfield mixing chores while maintaining ultra-precise detail at high volumes as your mains. 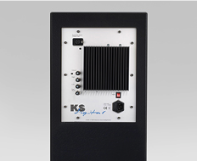 As with all our studio speakers, the KS Digital ADM25 is hand-built in Germany for you and comes with a signed Certificate of Authenticity, and includes a full 2-year warranty. Dimensions H 133 x W 26 x D 35 cm, 52 1/3" x 10 1/3" x 13 2/3"